When my parents used to bring home a whole smoked fish, I just couldn’t help sneaking the buttery flakes right from the newspaper where my Mom was taking it apart. The smell of daily news soaked with smoky fat (smoked fish in Russia was always sold in newspapers) made the air heavy with anticipation. Yeah, I know, not exactly an appetizing description by American standards, but that unmistakable smell makes me drool to this day. Maybe that's why I have a soft spot for smoked fish. It reminds me of weekend lunches in our home in Moscow -- smoked mackerel with boiled potatoes, and buttered pumpernickel bread. Of course, smoked fish is wonderful as is – eaten right from the newspaper it was sold in -- but I have discovered other uses for it that are a bit more up to date. I don’t remember ever seeing a soup made out of smoked fish, but I tried it once and it became the official hearty fast food of my household. No need to make the fish stock -- smoked fish has enough flavor for the whole pot and then some. Potatoes make this a comforting and hearty dish, and fennel gives it a subtle mineral note. Make sure to have plenty of good crusty bread for dipping. Set a large heavy pot over high heat. Add the oil. When oil is hot, add fennel and cook stirring occasionally until nicely browned, about 7 minutes. Don’t stir too much so that fennel has a chance to brown and develop flavor. Turn down the heat to medium. Add garlic, potatoes and thyme (or rosemary), season generously with salt and pepper and cook stirring occasionally until garlic is aromatic and tender, about 2 minutes. Break up trout into chunks and add to the pot. Add wine, water, and bay leaf. Cover and bring to a boil. Taste and correct seasoning. Liquid should be well salted since potatoes will absorb a lot of salt. Reduce heat to low and simmer covered until potatoes are very tender, 30-40 minutes. Stir in cream and serve sprinkled with chopped fennel fronds. Note: This soup reheats beautifully and usually tastes better on the second day. hi helen, i love using fennel (be it the bulbs, fronds, seeds or pernod) to flavour anything piscine and this chowder sounds absolutely divine! thanks so much for sharing the recipe...and what a gorgeous picture! I know exactly what you mean about the butteriness of smoked fish. I still remember the day I discovered smoked trout. What a wonderful recipe! Thank you for sharing. I will definitely try it the next time I buy some smoked fish! This recipe definitely sounds like a keeper! 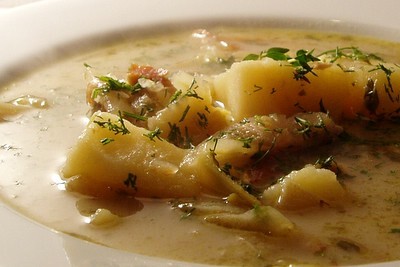 Hi Helen -- Thanks for the okay to add this great-looking chowder (I'm so intrigued by the smoked fish idea ...) to a Fennel Round-up, a whole collection of fennel recipes from food bloggers all over. It's such a versatile vegetable! Helen, could I make this with a fish that isn't smoked? I know it won't have the same taste, but I need to make sure that the fish is gluten free. I'm thinking of making this recipe for our soup course for Passover on Wednesday night (this week, two days from now!). What do you think? I love the fact that these older postings stay around. Was looking for a recipe to use some smoked trout I have in the fridge and this is perfect. Thanks.